Seaweed salad, originally uploaded by Camemberu. Update on 13 April: please read this comment below for one reader's bad experience since the post was published. It seems the restaurant was unable to handle demand in certain situations. Update 10 June: have received a comment that prices have gone up to S$68+++! Please call to confirm if you do decide to go (also check buffet hours). Sorry for the delay. Here's more on Wasabi Bistro, continued from the previous post. After the glut of rich, creamy sensations, we called for a salad. 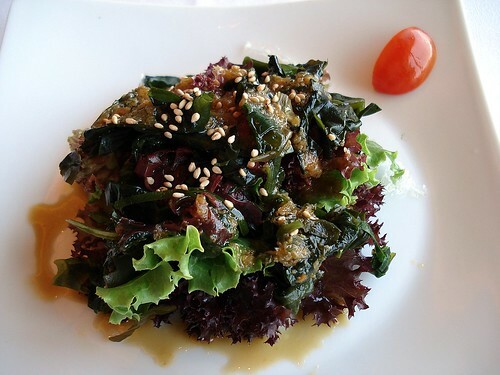 The seaweed salad was a generous dish of crisp, fresh greens and wakame, doused with a tangy ponzu dressing. All of which helped cut through the grease and prepared us for more tasty things to come. 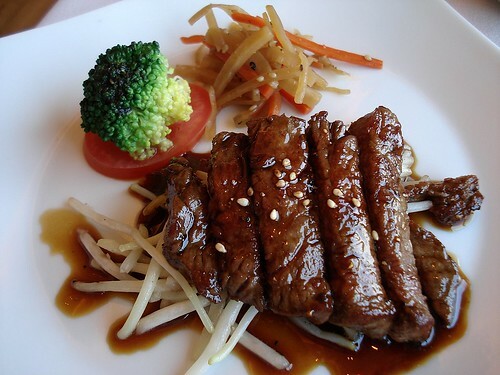 Australian beef tenderloin in teriyaki sauce, originally uploaded by Camemberu. 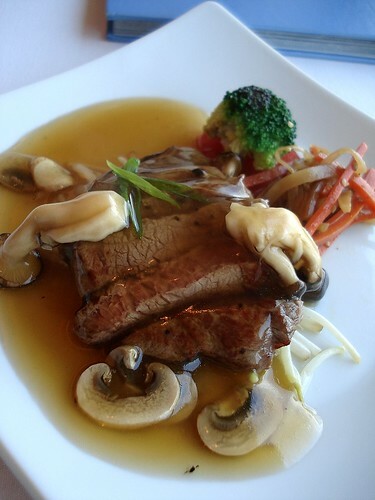 The teriyaki beef tenderloin was hubby's absolute favourite of all the dishes here. The dark, caramelised teriyaki sauce brought out the oomph in the beef that was seared just right. Australian beef tenderloin in mushroom sauce, originally uploaded by Camemberu. The mushroom sauce version was not so good. Very thin on taste and the beef was undercooked in some parts (no, not the pink and bloody rare type of doneness, just the cold chilled type of raw). 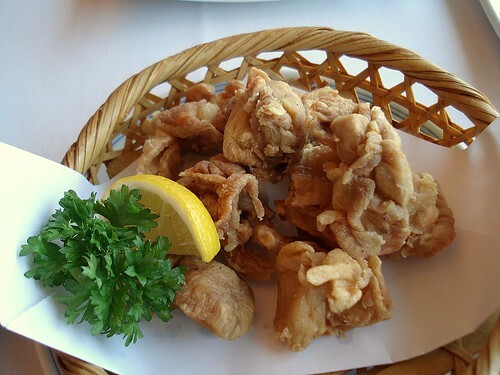 Tori karaage, originally uploaded by Camemberu. The other thing we didn't really like was the chicken karaage. I think they used thigh meat, which tastes more gamey than breast meat. Oh well, some people might prefer this instead. Mildly spiced and fried bone dry, the chicken was served with a spicy mayo-chili sauce, similar to the one for Dynamite rolls. 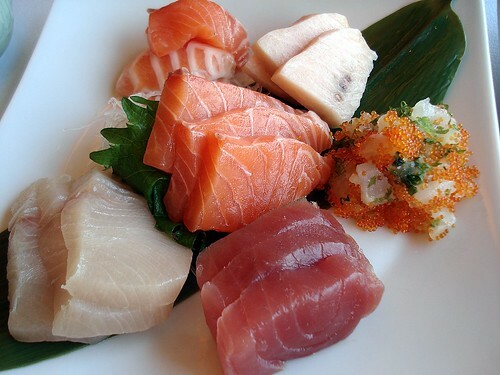 "Sabi" sashimi platter, originally uploaded by Camemberu. Oh yes, you can have unlimited sashimi here too. They have two sizes. "Wa" for 1-2 pax and "Sabi" for 2-3 pax. Thick slices of salmon, tuna, swordfish, yellowtail (I think) and some white fish chopped up together with tobiko and shisho. While I've had better elsewhere, the sashimi here at least did not have any sinews at all. Yet another generous platter! 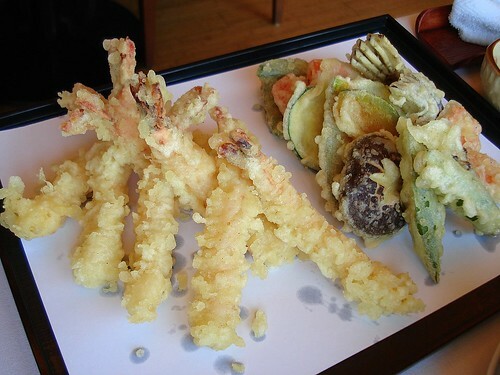 Eight shrimp tempura and vegetables of all sorts - okra, carrot, shiitake mushroom, pumpkin, eggplant, zucchini, red and green pepper! Crisp batter but just a bit too greasy for my liking. Zaru soba, originally uploaded by Camemberu. 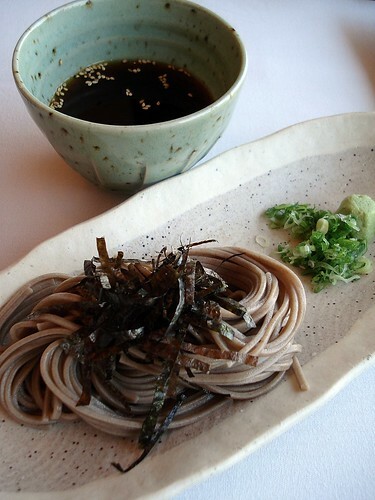 Some cold soba to wash it all down. Hubby always likes to have a portion of this at every Japanese meal. I think by now we've eaten way too much. Time for dessert! 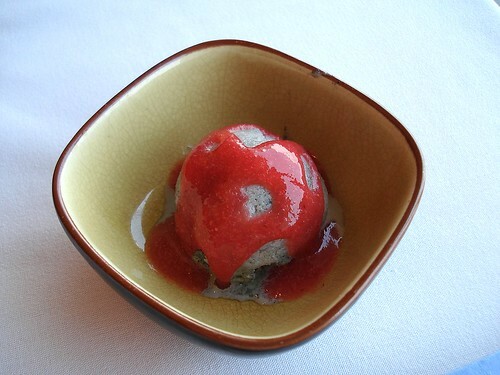 Black sesame ice cream, originally uploaded by Camemberu. Not just a straightforward scoop of black sesame ice cream. It has two layers, a lighter icy grey on the surface and a dark, creamier centre. Topped with strawberry coulis. Matcha shiratama, originally uploaded by Camemberu. Half the dessert menu was not available. We could only choose from ice creams, matcha shiratama and fruits. 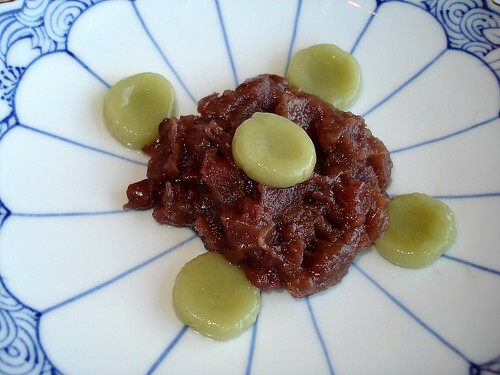 The matcha shiratama is a tiny serving of sweetened red bean pulp with five dimpled mochi slices. Tasty morsel, but really only adequate for one person. 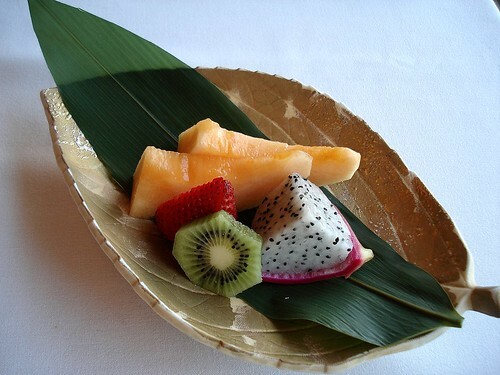 Fruit platter, originally uploaded by Camemberu. Finally a platter of fresh fruits to cleanse the palate. Again, such beautiful presentation. I love that wide decorative leaf. 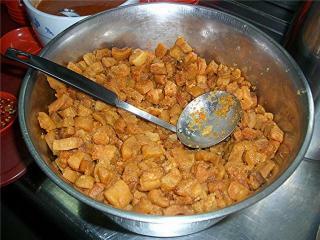 The muskmelon or cantaloupe is extremely fragrant and sweet. But it can't be from Japan, or the price of the buffet would easily double! So there you have it. Most Sunday brunches are rather costly affairs and this one is no different. But at least it's one with a different touch, and has lots of healthy omega-oils included via the fish and seafood. Oh, there were so many other dishes I wanted to try - the cod misoyaki, teppan dishes, other rolls and salads. Those interested in the full menu can take a look here. I assume the other free flow drinks are only available with the champagne option? you did an amazing job sharing this - wonderful pictures and comments, thanks! was waiting eagerly for this next post since i saw the 1st one! great review! everything sounds delicious! Bugger and Southernoise: yeah I think all the booze is part of the optional extra (add S$55 to the S$58 buffet). But you do get a nice freeflow green tea with the regular buffet. That was enough for me. Amanda and jj: thanks! :) Glad you like the review. Linda: Hope you get to enjoy the buffet too, linda! Am glad you went to try it! This is definitely one of the few buffets that are definitely worth it. The Kumi's no.1 is finger-licking good, unfortunately only one order is allowed. Keep up the posts!!! Hi Bottomless! Yes, I have reviewed MELT. In fact, we liked it enough to go a second time! K-man...just give in to temptation! Haha, dang, I am actually tempted to go a second time too! :P The seaweed salad is really good. It was gone in no time. So too, the beef tenderloin. I should have asked for a second helping all for myself. just back from Wasabi Bistro. they're some dishes thats pretty OK like the Kumi no1, scallop rice, garlic fried rice and the beef teriyaki. The service is lacking and and pretty understaffed. 3 servers couldn't cope with 6 tables and no attention was paid to whether the green tea was served to new customers, plates and cutlery replaced for those taken away. And also a few wrong orders served. I feel that overall the restaurant is not that "sincere" in having an ala carte buffet at all. No papaya is understandable as who knows the papayas are not ripe enough etc etc but no Tofu at all is inexcusable. I asked the waitress and she mentioned that the other tables ordered a lot. It shows how much tofu stock that they have when there's only 6 tables and it was only 115pm. Also they've forgotten to sharpen their knives as I got a few sashimi all stringed together. Out of the list of dessert only 3 was available. One being fruits which was a no brainer. Others was the mochi/redbean and black sesame icecream served plain unlike the one you were served. This sounds like a rant but really, that was the overall impression I had. Maybe the main chef was not around today? Caveat emptor I would say! Oh oh... and Sunday brunch starts at 12noon and last order at 215. I asked them isn't it 4pm and they said that was 6 months ago. Hey southernoise, sorry to hear your experience wasn't good. Seems they are not used to sudden crowds like that for their Sunday brunch - running short of food, giving less attention to detail and making errors! When I was there, there was only two tables (including mine). Easy work for the 2-3 servers. They did not tell me about any last order. The noon-4pm timing is from their website. You could be right - maybe the main chef is not around. Did you get the elderly Japanese chef Ishii-san making the rounds? But even so, something is amiss if they can't even cope with six tables. Unless those six tables were filled with voracious people with insatiable appetites and demands! Thanks for the feedback though. Useful to others who are planning to go - may want to go elsewhere or wait awhile to let Wasabi cope with the increased demand. no leh, there wasn't any chef making rounds. I strongly suspect that the main chef was not around. Wow, great shots on your blog. "Oh my gosh, you blog like 3 posts a day and each one so detailed!!!! You are hands down the most prolific blogger I have seen!" Went this afternoon. Was charged S$68++ per person ! Price in April S$58++..S$10 difference !! Wow, that's a steep increase! Well, with the prices of everything going up, up and away, I'm expecting most hotels to revise their pricing upwards, if they haven't already done so. Thanks for the alert. Will update the info. Thanks for confirming it, Lester. Yes, pricey indeed. You can still eat your money's worth but not ALL items are good. Their signature stuff is nice though. This place has definitely gone down the drain. I went yesterday, and there were a total of 3 tables and 3 servers. The service was horrible. The first batch of dishes we ordered took forever to come. When they finally came, the servings were super small, the type you can consume in less than 30 seconds. We ordered about four or five dishes again, and this time, only one dish came. After waiting another 10 or 15 minutes for the rest to come, we asked a server to follow up on our order, and he said we have no more orders outstanding. So essentially, we were waiting for nothing. The whole lunch dragged till 2:30 with little bits of food being served here and there. It didn't even feel like we were having lunch, more like a very stingy taste-testing session. What more, the food wasn't anything fantatic and tasted quite plain and kinda bland. I am never ever ever coming back to this place, even for their a la carte meal. And no, I don't think anymore that this is about the chef being there or not. He was there and he came out to talk to the table next to ours who ordered a la carte instead of having the buffet. Just visited Wasabi Bistro today for lunch, just a few comments. Presentation seems to have changed a fair bit since your visit. Seaweed salad looked different, dynamite rolls came with no sauce nor did the tori karaage. Beef tenderloin was only served with bean sprouts. Menu was tweaked quite a bit, notably missing the Baked Dynamite Scallops and (Cod Saikyo Misoyaki/Teppan seafood/Teppan Chicken/Unagi Kabayaki/Salmon skin rolls/Fried oyster rolls/Hijiki/Shishamo). Having said all that, the food was pretty good but if the items that were removed from the menu remained in it, the experienced could have even been better. I blieve they still had 3 or 4 servers and service was pretty ok.
Wow, looks like the cost-cutting just keeps going on. I hope they didn't have to cut the chef off the payroll! No, I wasn't on some special food tasting. I didn't even have my DSLR then, so my tiny camera was quite discreet. The chef not only came to my table, but to other tables as well. Thanks for the feedback! Useful for other readers and myself too! I live in Europe so I won't be able to go have lunch at Wasabi Bistro. But thanks for taking me there through your description and images! That seaweed salad and tempura look divine!